75th and Sedgwick: Pass the cheese, please. What a delish lunch, and such a fun way to treat yourself. Lately I've been living for ricotta, so your pick sounds perfect. Do you sometimes pinch yourself and say "Here I am, meeting my husband for lunch on a Tuesday in Soho, NBD"? Too fun. Jeff and I work a whopping 4 miles from one another now and I miss meeting him for lunch, it's such a nice way to break up the day. Anyhoo... speaking of lunch... I saw this in my Southern Living magazine the other day and had a giggle. 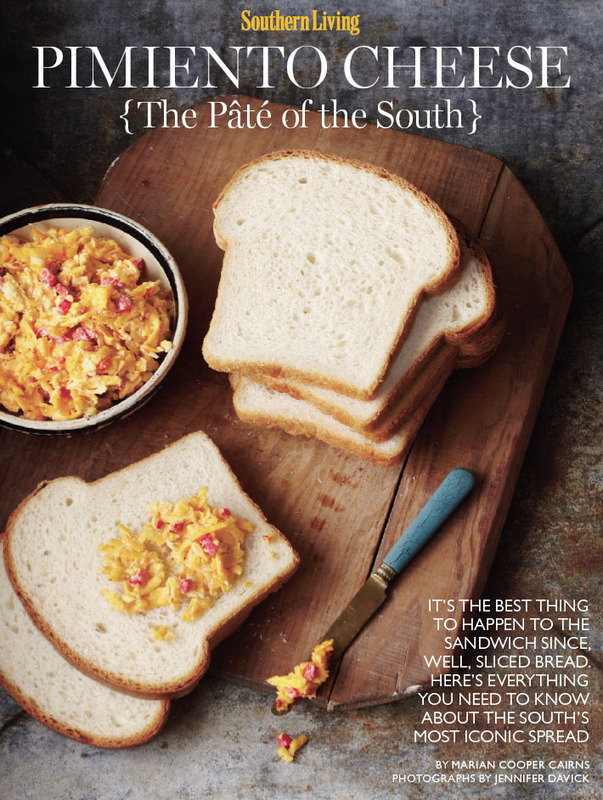 I had never heard pimento cheese referred to as "The Pate of the South". Probably because in Louisville, they just call it pimento cheese. Hysterical. This is one of the things I learned when I went to college in DC... turns out most people don't put spaghetti noodles in their chili and pimento cheese is VERY regional. Who knew?! I know, I too was so provincial (see below). Funny thing though.... I hate it. 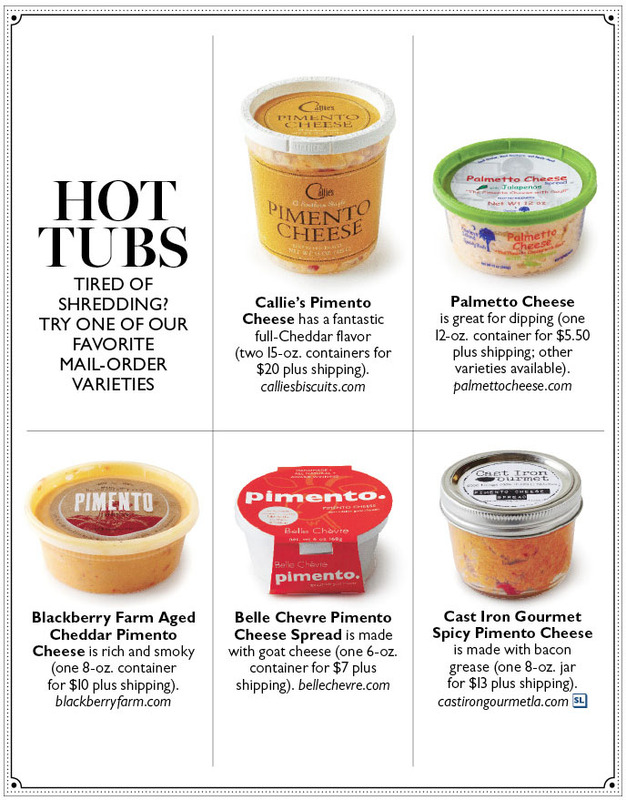 Literally, HATE pimiento cheese spread. 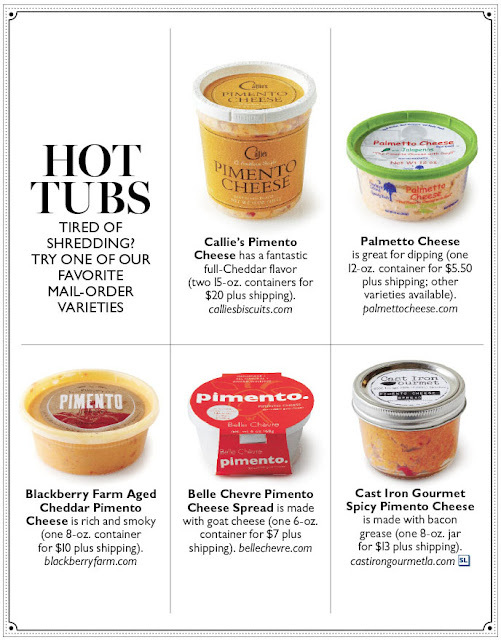 Yet STILL when I'm at my parents' house looking for something to eat, my mother without fail suggests: "What about some pimiento cheese?" It's seemingly just too bizarre for her to wrap her head around that her daughter not care for it, so she refuses to remember this fact. Have you ever tried it? I think you would really like it. Jeff (from Boston) LOVES it and still can't believe he married the only woman from south of the Mason Dixon line that doesn't. Pimento cheese sandwiches are one of the staples of the Masters in Augusta, so maybe this year, I'll make some for Jeff while we watch the tournament. Maybe. Of course you can make your own, but I'm sure you can find it all over New York. I don't know why I think this, maybe the long-held belief that you can find anything in NYC? OR you can always order a pot o' cheese online from one of these fine establishments. More on the history of pimento cheese from a woman who wrote her thesis about the orange spread. The *best* pimento cheese is from HEB/Central Market in Texas. I didn't like pimento cheese before having some from there. Now, I can't get enough of it. I won't lie, before heading to the airport after visiting my parents, I'll sometimes make them stop by so I can get a container for my flight back. Yum! Homemade is pretty good too - I don't really like the processed containers that you can find here. Pimento Cheese Rocks. Plus, now that you said that thing about the Masters, you pretty much have to do it. It's in writing. I'm with Deweese! My mom is a southern lady who loves Pimento cheese sandwiches, but I am NOT a fan. Bird, You're brave to stay in town. I had to leave, for fear of pimento shunning!